A Thai man in his 60s who was jailed for 20 years for sending text messages deemed offensive to the royal family has died, his lawyer said. Ampon Tangnoppakul was admitted to hospital last week for a pain in his stomach, the lawyer told the BBC. His wife found out that he had died when she visited the jail in Bangkok this morning. The cause of death is being investigated, said a doctor, and it is still not known when Ampon died. He was convicted in November last year of sending four messages to an official working for then Prime Minister Abhisit Vejjajiva. He denied the claims and said he did not know how to send a text. The conviction - the heaviest for a lese majeste case - sparked outrage among rights groups, with Amnesty International describing Ampon as a political prisoner and the European Union expressing ''deep concern''. Ampon, who became known as ''Uncle SMS'', had been hoping for a royal pardon, his lawyer Anon Numpa said. He was charged under the Computer Crimes Act and lese majeste law, which is designed to protect the monarchy. 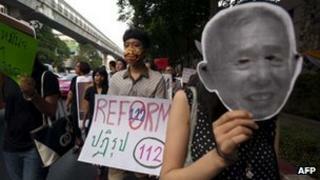 Critics say both laws have been increasingly politicised and used to curb free speech in Thailand. Activists have called for the laws to be reformed. A number of foreigners have been convicted of the offence in recent years, but they are often quickly pardoned and deported from the country. Some Thai academics and writers have fled the country for fear of being denounced. In one current high-profile case, the webmaster of a liberal news website has been put on trial for allegedly failing to remove offensive comments posted by readers quickly enough. The verdict for the case is due at the end of this month.